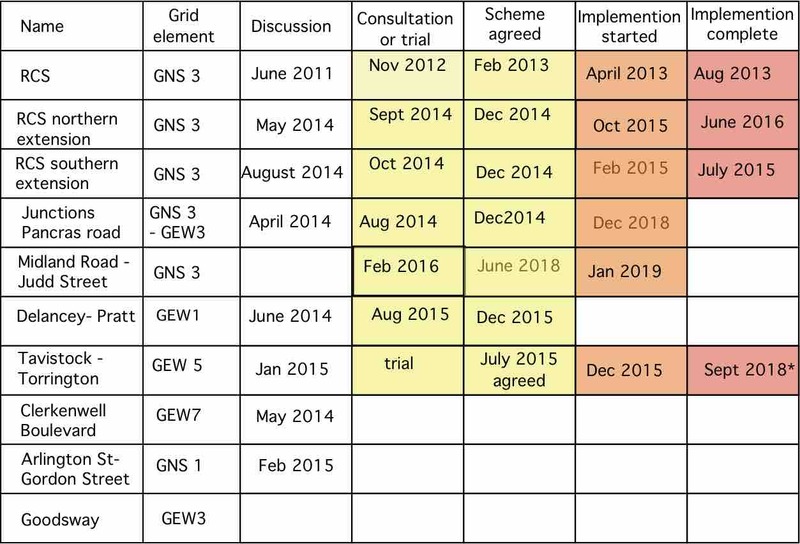 Camden Council planned an ambitious network of Central London Grid and Quietway routes in autumn 2013 and we gave them some feedback as to our priority for their being implemented. We took a deputation to Camden’s Culture and Environment Scrutiny Committee at which Andrew Gilligan was present 3rd December 2013. See the post on this event including the map showing our preferred five Grid and five Quietway routes. In December 2013, TfL consulted on their provisional alignments for the routes in the Central London Grid. See our post about the Grid announcement which includes a labeled map of the routes in Camden and some notes as to which will receive early funding. Then in early 2014, they published another map showing the Grid routes to be completed by 2016. Camden was awarded funding for several projects as part of phase one of the central London Grid, including the northern extension of Royal College Street to Kentish Town Road and a southern extension to Goodsway. A trial in Tavistock Place started in November 2015 was made permanent Summer 2018 and again consulted on changing to westbound motor traffic December 2018 – we hope it will remain eastbound and that stepped tracks and other improvements will be implemented. The cycle provision in Royal College Street itself was completely overhauled during summer 2013: the two-way cycle track was replaced by wider single cycle tracks, one on each side of the road. See the post about the new scheme in Royal College Street. See the post about the official opening of Royal College Street. Pancras Road Junctions – Goodsway and Camley Street – following consultation, new design for Midland Road/Pancras Road; approved 12th December 2014. Further discussions still ongoing October 2016. Work started December 2018. Royal College Street Northern Extension – Baynes Street to Kentish Town Road; following consultation, approved 16th December 2014. Construction started autumn 2015 and completed June 2016. Audited by CC and some changes made. See more details here. Royal College Street Southern Extension – Crowndale Road to Midland Road consultation completed November 2014; signed off 19th December 2014, implementation started early in 2015, completed Autumn 2015. See more details here. See our report after implementation RCS Southern extension. Delancey-Pratt – a route on Pratt Street from St Pancras Way to Camden High Street and then on Delancey Street to the junction with Parkway. Studies from summer 2014. The new draft design presented to us Feb 2015. Consultation September 2015. Agreed December 2015. Still waiting for TfL consultation on re-routing #31 bus, May 2017. Our deputation in support and Petition against the route, Nov 2017. Wait for consultation on Parkway Junctions in 2019. Tavistock Place: campaign started with video in August 2013. January 2015, WEP report announces a trial for Tavistock Place with existing 2-way track for EB cycles and the WB motor lane for WB cycles. Camden Council announces the trial, July 2015. A trial started autumn 2015. See report. Safer Bloomsbury Campaign started. Consultation October 2016. Public Inquiry Oct 2017. Made permanent Summer 2018. Consultation on whether motor traffic should remain eastbound. Nov 2018. New junction at Delancey/Parkway/Prince Albert Road/ Park Village East /Albany Street /Gloucester Gate: studies started in summer 2014 and draft design is shown to us for discussion in February 2015. Still waiting October 2016. Probably to be consulted on in 2019. Clerkenwell Boulevard. We had hoped it would be designed as an addition to the work on the Holborn gyratory during 2015 with consultation expected early in 2016 Read about the campaign here. But the Holborn scheme is waiting for funding from TfL until WEP is in place. LCC launch London Boulevard campaign May 2017. Camden has funding for a study early 2018 and has Camden submitted LN bid for gyratory removal late 2018. Quietways are generally radial routes coming into Camden from one of our neighbouring boroughs to the west, north and east. Typically they will link up with our Grid routes as they approach central London. These have been a failure because QW2 and QW3 are on roads that require filtering but cannot be filtered for varuous reasons. So they have not been built. QW3: originally called Jubilee Quietway – runs through Brent from Dollis Hill to Kilburn High Road and then through Camden on between West and South Hampstead. It then continues into Westminster as a Grid route on St Johns Wood Park and southbound on the western side of the Outer Circle. No work carried out in Camden. QW2: originally called Quietway 38 – starts in Waltham Forest and runs through Hackney and Islington where it becomes a Grid route and runs into Camden on Calthorpe Street and Guilford Street. The Camden end has been diverted via Ampton Street to the Tavistock Place alignment. QW12: Compayne Gardens to Greville Street to link with Westminster QW 16. See QW 3 and others that show the proposed alignment of this QW.No work carried out in Camden. North-South Cycle Superhighway: this runs in a two-way track on the west side of the road from Elephant & Castle, over Blackfriars Bridge as far as King’s Cross (Judd Street). Consultation in Autumn 2015. See our discussion on CycleScape. Construction completed 2015. Consultation of nothern extension of CS6 in spring 2016. Scheme completed summer 2018. CS 11: the planned route runs from Brent Cross, via Hendon Way and Finchley Road, through the Swiss Cottage gyratory, down Avenue Road and into Regents Park. It uses either side of the Outer Circle to reach Portland Place. Progress and details. Consultation on CS11 spring 2016. Consultation report available – 60% in favour. Still waiting for decision on the gate closures, Apr 2018. Stopped by Westminster Council 2018.